The Adaptive Size slider is an important parameter for ZRemesher, even though its default value is the best one to use in most scenarios. This setting defines the polygon distribution for your model and can drastically increase the quality of the topology by giv­ing more flexibility to the algorithm. Adaptive size defines a vertex ratio based on the curvature of the mesh. To maintain the original mesh shape, ZRemesher may need to increase the topology density in cer­tain areas or produce triangles rather than quad polygons. On the left, Adaptive Size is set to 0. On the right it’s at 50 (default) with a polygon count set to 5000. Notice the variation in polygons size and shape, making the right model more detailed even though the polygon count is the same. For this illustration, Adaptive Density mode was enabled. Model courtesy of David Richardson. Polygons which are as square as possible. Polygons which are approximately the same size. A polygon count which better respects the set polygon target. The flip side is that there’s a risk of topology irregularities where the polygon count is kept low in areas with small extrusions. Note: Please refer to the Adaptive Density mode setting if you wish to force the number of polygons to be close to the value you defined for the Target Polygon Count setting. Polygons which can be more or less rectangular in order to best fit the mesh’s curvature. Polygon density which can vary throughout the model. ZRemesher is allowed to create smaller polygons where necessary (such as with fingers or toes) and larger polygons where less detail is needed (like the top of a head). Less control over the polygon count, in order to better respect the mesh’s original shape. 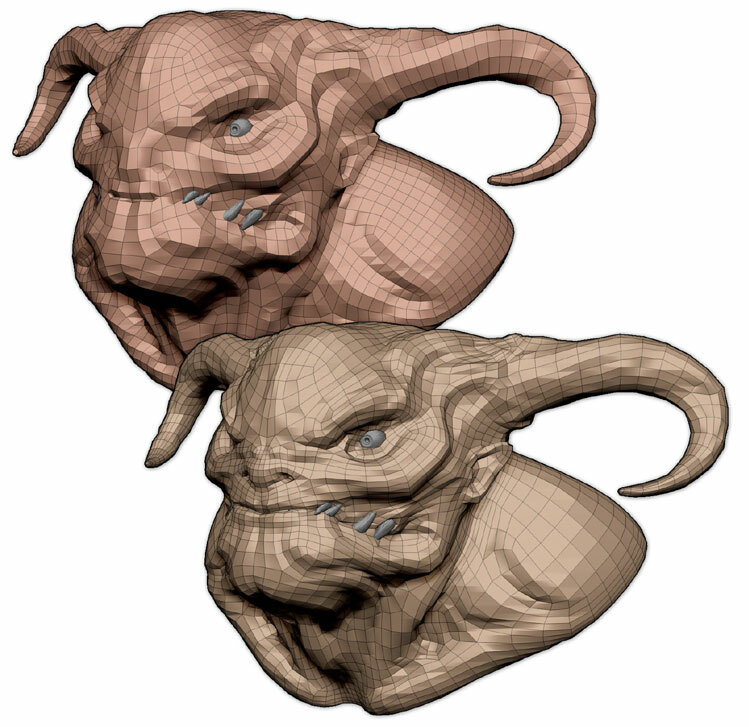 By increasing the value of the Adaptive Size slider, you will increase the quality of your retopology. However, ZRemesher will need to be more flexible regard­ing the target number of polygons. The reason for this is simple. When targeting a specific polygon count, ZRemesher first distributes them equally across the model. ZRemesher then analyzes the mesh cur­vature deforms polygons and/or changes their density to produce a result that matches the model’s original shape. To best respect the number of polygons defined by your Target setting, simply set Adaptive Size to zero, resulting in a uniform distribution of square polygons. If this pro­duces undesirable results in areas such as fingers, disable the Adaptive Density mode instead. This forces ZRemesher to get as close as possible to the Target Polygon Count setting. Note: If the target polygon count is too low, the algorithm won’t be able to keep finer details or cur­vature since it won’t be allowed to create smaller polygons or non-square polygons where needed. 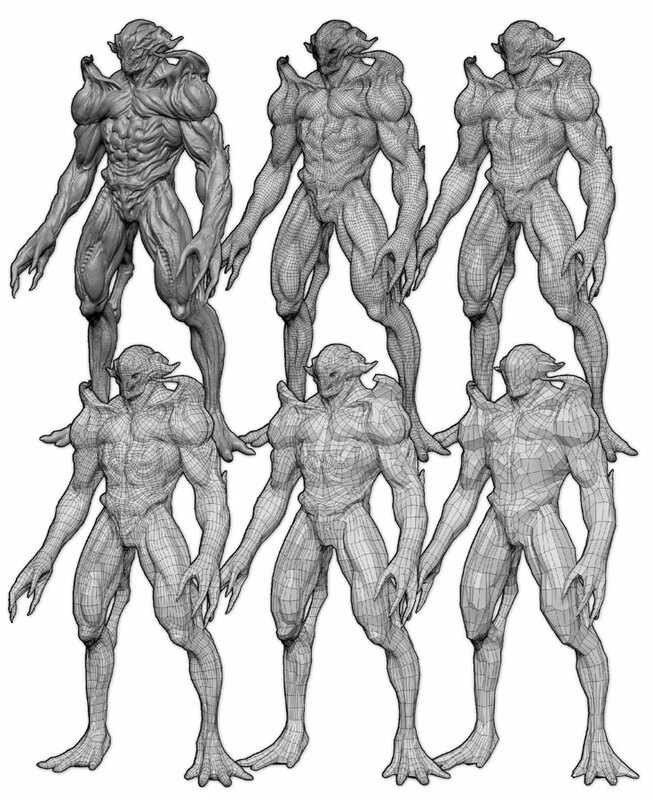 From left to right and top to bottom: The original model, retopology of 40K, 20K, 10K, 5K and 3K polygons. Regardless of polygon count, using the Adaptive Size setting always provides good results. Model courtesy of David Richardson.